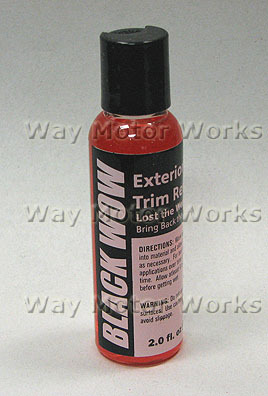 Black Wow is designed for any color exterior plastic such as on the MINI Cooper, Honda Element, Jeep Cherokee, Toyota Tacoma, and others, this gel will restore your trims natural color without use of dyes or colorants and provides a rich, long lasting look (measured in months), proven by the water beading action. A product conceived by show car detailer, Richard Lin, aka OctaneGuy and formulated by his father, a world reknowned award winning scientist. This is a smaller 2oz bottle. Also avail in a 4oz bottle.